The best part of making Stained Glass Cookies is that they can come in all kinds of flavors and colors. It’s time to get creative! Our next holiday cookie in our cookie countdown is The Stained Glass Cookie. 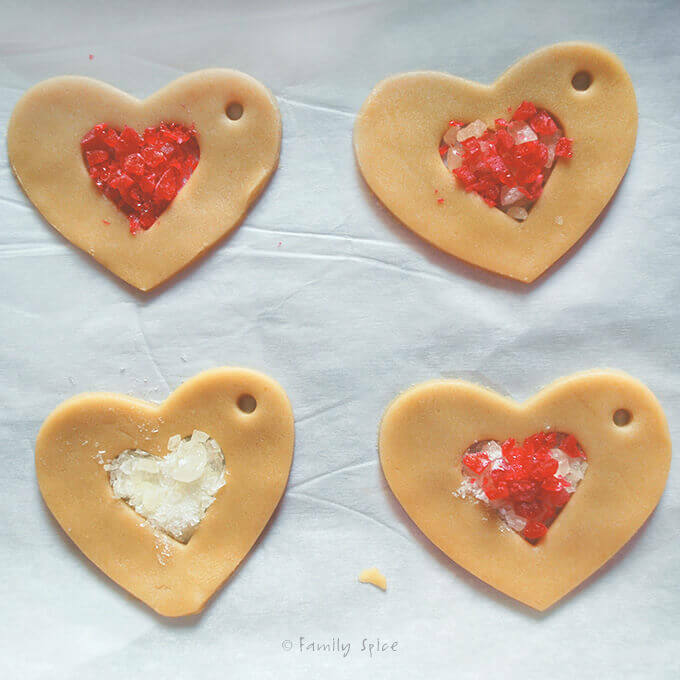 I know, I know, I’m showing a picture of a heart cookie and not a Christmas tree or star. I made these for Valentine’s Day last year and never got around to making a few for the other great holidays to photograph. I think I should change the name of my blog to the Distracted Cook because that’s honestly how I cook and bake. I thought about doing other shapes and colors at the time, but I had to finish the cookies before the hubby came home, clean up and then get dinner started. Plus, the kids wouldn’t do their homework because I surrounded their space with candies, some arguments popped up, lots of whining, “I want to eat some candy, too….” You see what I mean? I am totally The Distracted Cook. 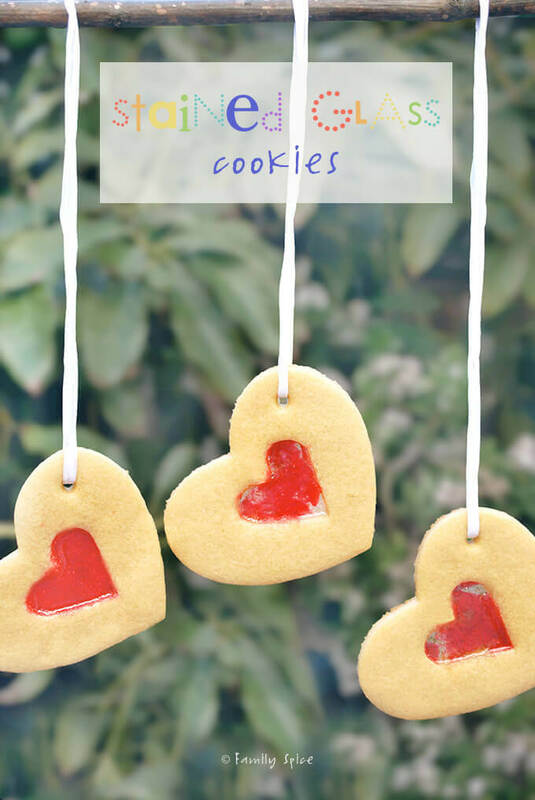 These are a fun and festive cookie that the kids will enjoy: a cookie and a candy at the same time! 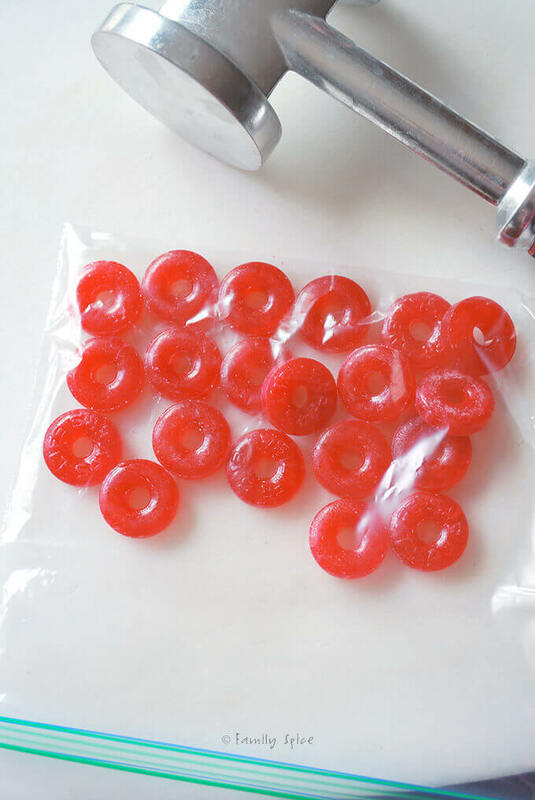 I used crushed up Life Saver candies, but you can use Jolly Ranchers or other clear candies. 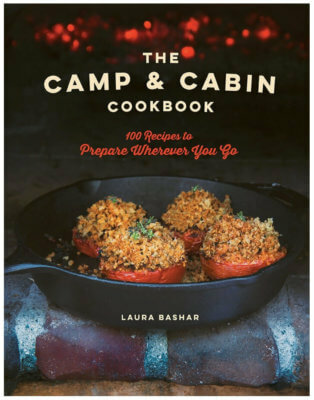 I tried two different recipes for this project, hence even more MAJOR distraction that day. One was from Simply Recipes and the other Martha Stewart. Martha won the showdown. You want a great sugar cookie base to keep it’s shape and not spread. And you only need a little sprinkling of candies to fill the center. You don’t want the candies to touch the edges of the cookie or else they will bleed into the cookie. I didn’t read that part of the recipe. I blame the kids, of course, so some of my cookies did have red bleeding into them. Still tasted great! 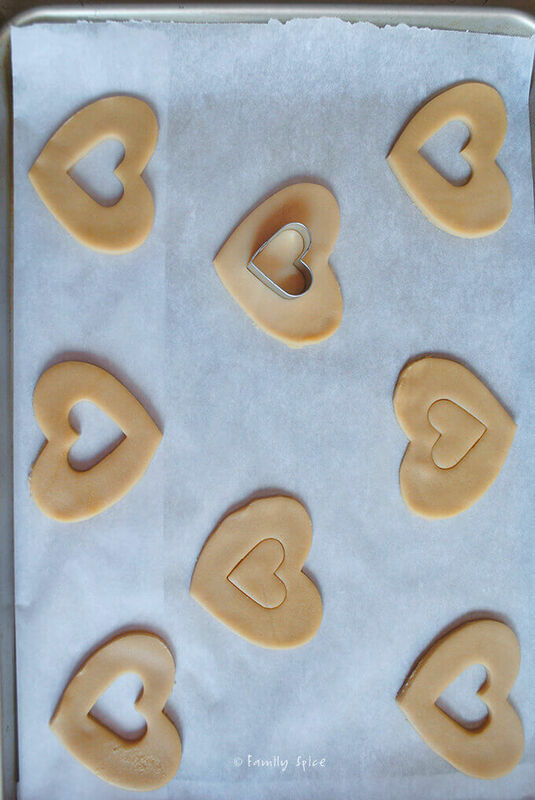 If you have little shape cutters you can easily do hearts, stars or flower cookies. For the Christmas tree, Martha cut a triangle in the center of the tree and filled that in with the candies. If you want to hang the cookies, after you take them out of the oven, use a lollipop stick to press a hole through the cookie, kinda like a hole-punch. Then let them cool and harden. This is a great project to do with kids. I rolled and cut the cookies, while their little fingers helped fill in the holes with candies. And of course, if any spilled on the table, well, they were fair game to pop in the mouth! Put mixer on low speed, gradually add flour mixture, and beat until combined. Wrap dough in plastic wrap or parchment paper and refrigerate for 45 minutes. Remove dough from the refrigerator and place on a well-floured work surface. 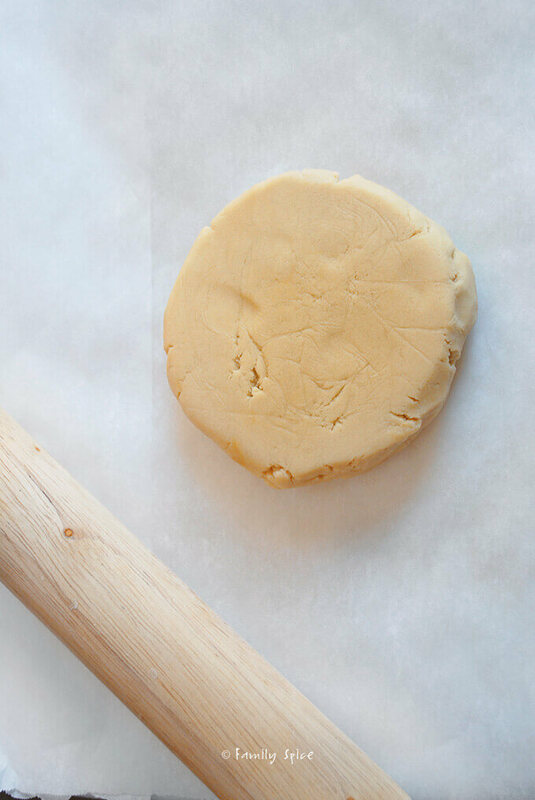 Using a rolling pin, roll out dough to a little more than 1/8-inch thick. 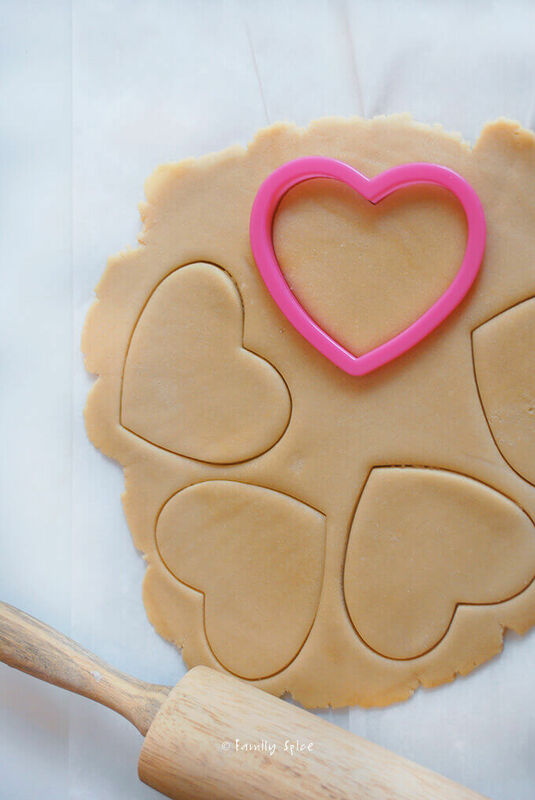 Cut into desired shape and using a small spatula place at least 2-inches apart on a baking sheet lined with parchment paper or silicone baking mat. 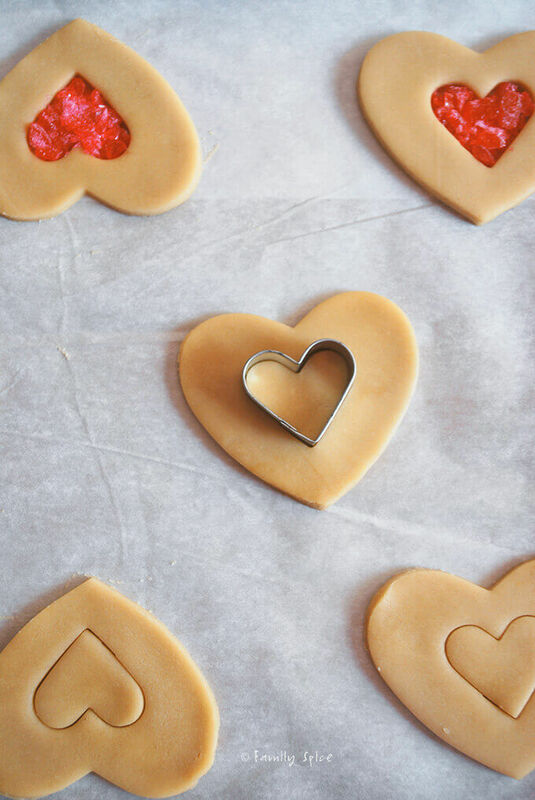 Use smaller cookie cutters to cut the desired shape for the inside of the cookie. You can also use the tip of a sharp pairing knife. Avoid candies from touching the edges of the cookie, otherwise candies will bleed into the cookie. Refrigerate until dough is firm, about 15 minutes. Bake cookies until candy has melted and completely filled cutout and cookie edges are just starting to turn a light golden brown, approximately 11 minutes. Do not let the cookies brown or the candy centers may become bubbly. Let cookies cool completely on sheets on a cooling rack. Use a metal spatula to remove cookies from the sheet. Serving Suggestions: Try these for any holiday and in an assortment of colors! I can well understand your dilemma!! These are so pretty, you did a fabulous job! I blame the kids for distracting me in the kitchen too, but truly, I think these look perfect.